CASE PRICE for 14 books is $7.00 each 53% OFF! The Next Generation Needs You to Be a Spiritual Mentor. You are meant to be a mentor. You probably have more “friends” than ever—once you tally up all your social networking connections. But virtual relationships alone can’t meet the Church’s desperate need for spiritually mature women and men to mentor younger believers to be faithful servants of Christ. If you are like many believers, you may not feel prepared to be a trusted influencer because you haven’t had a spiritual mother or father yourself. 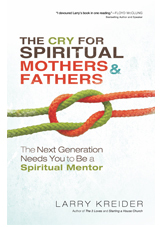 The Cry for Spiritual Mothers and Fathers, written by seasoned disciple and Christian leadership trainer Larry Kreider, will give you the proven biblical keys you need to become a godly mentor. Discover why spiritual mother- and fatherhood is every believer’s calling, and find out how to nurture a spiritual family that expands the kingdom of God. This is the essential handbook for answering God’s call to become the spiritual father or mother He has called you to be. Check out the first chapter here!